This large sign sits along the walkway to the centre. The large sign provides information of the RCMP. The walkway leads to the entrance of the RCMP Heritage Centre. 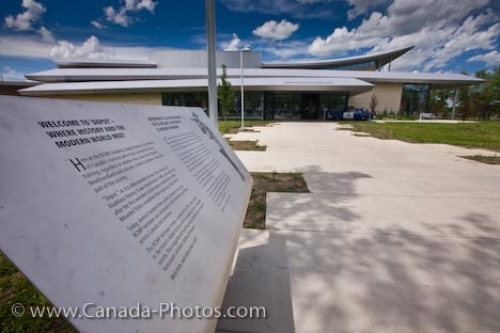 The heritage centre has exhibits of the Royal Canadian Mounted Police. Sign at the entrance to the RCMP Heritage Centre in the City of Regina, Saskatchewan, Canada. An informational sign sits along the walkway to the entrance of the RCMP Heritage Centre.